A full electric racing car is an interesting concept. With 20 minute run times, 93 mph top speed, it will not do too well as a race car. Even short sprint races are 30-50 minutes. The car shares very little with the actual production LEAF, mid mounted motor, rear wheel drive. Shorter in length, wider, and about a foot less tall than the production car LEAF. The full press release from Nissan is below. 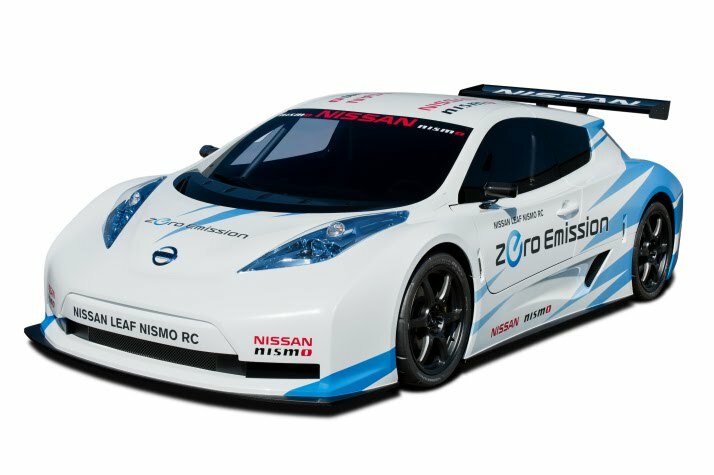 “Combining the talents of NISMO, Nissan’s world renowned motorsports group, and engineers behind some of the company’s Super GT and FIA GT1 race teams, the Nissan LEAF NISMO RC will serve as a rolling laboratory for the accelerated development of EV and aerodynamic systems, as well as a platform for the development of new green motorsports series,” said Carlos Tavares, chairman, Nissan Americas. The Nissan LEAF NISMO RC is designed and constructed as a real racing machine, starting with its full carbon fiber monocoque bodywork. The three-piece bodywork includes removable front and rear sections, fixed windows, LED headlights and taillights and adjustable rear wing. Building on the unique exterior styling of the production Nissan LEAF, the 2-door race version was created by Nissan Global Design Center in Japan. Special 4-coat Pearl White paint with blue NISMO/Zero Emission graphics completes the exterior. Well from the features i can guess how amazing a leaf car is. I think this may be the best production of Nissan, right?